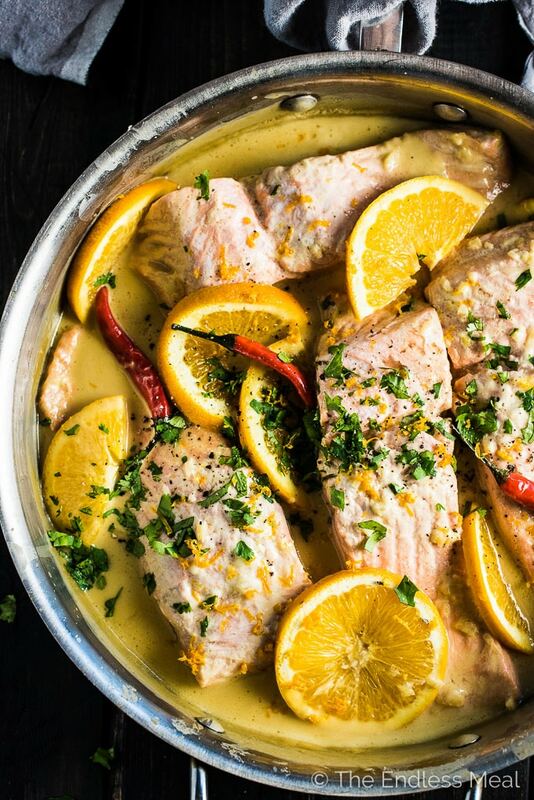 Coconut Orange Poached Salmon is my absolute favorite fish recipe and one I've been making for years. The gentle orange flavor and the creamy coconut were meant for each other and make a delicious sauce that is perfect for pouring over rice or cauliflower rice. A secret trick keeps the salmon super tender. This healthy dinner recipe is gluten-free + paleo + Whole30 approved. If I had to choose one fish recipe to eat for the rest of my life, this would be it. I've been making it for years and fall in love with it fresh every time I make it. I don't choose favorites easily, but orange coconut salmon is my fav. 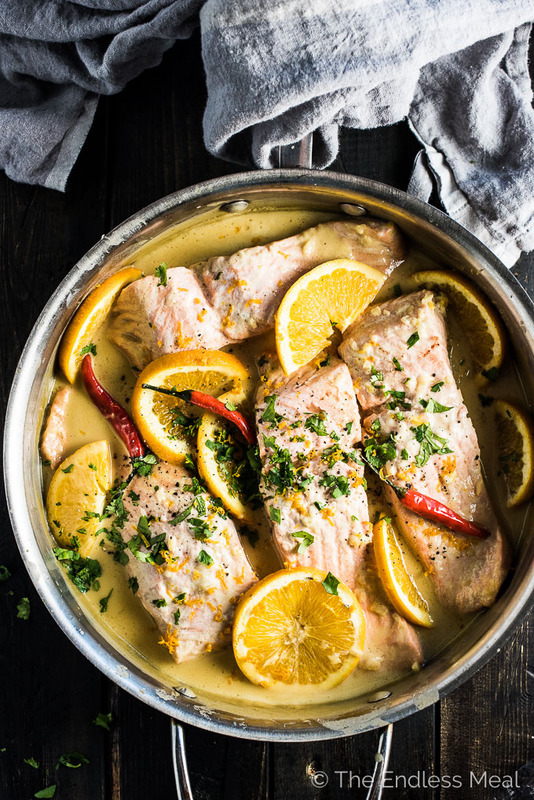 This Coconut Orange Poached Salmon is 100% paleo + Whole30 compliant, but don't make it because of that. Make this because it's the best damn fish recipe EVER. If you are doing the paleo or Whole30 thing, this is an awesome recipe to make if you're sharing your table with I-eat-everythings. ← Love those people. Make yourself some cauliflower rice and a pot of regular rice for everyone else. Win win! So it is officially Day 8 of this Whole30 adventure. Only (ha!) 22 more days to go. There have been highs and lows this past week. The biggest surprise is how much I've been learning about myself. It never occurred to me that a diet/detox/program would teach be about myself and my relationship with food, but it has. My jeans slide on easier. While The Whole30 Program is not supposed to be for weight-loss, most people who've completed it report they shed some pounds. I'm not going to lie, I was hopeful that I would, too. When I look in the mirror, I see my 22-year-old belly. Omgee already! In all fairness, my stomach has always been the last place I'll gain weight and the first place I'll lose it. But guys, it's so exciting. Psoriasis, the evilness that plagues my grandma, my sister, and me, seems to be going away. Maybe this is just some crazy coincidence, or maybe it's not. Could it be diet related? The sugar dragon is mean and brutal and slaying him is hard. There have been some crazy cravings. Last night, I would have walked over burning coals for a piece of after dinner chocolate. And I don't even think of myself as having a sweet tooth! Newly learned fact about me: I like to snack. A lot. How it's taken me 38 years to realize this, I'll never know. The cravings to snack (on anything!) have been harsh. Getting up from my desk and distracting myself with household chores seems to be the only way to deal. If you have any advice for getting through this part, bring it on! What about you, are you doing The Whole30? Have you tried it? I'm posting more about my adventures, as well as sharing recipes that aren't on the blog, over on Instagram. Follow along by tagging #Whole30groupies! I mentioned a secret trick for making sure your salmon stays tender and melts in your mouth. Actually, there are two tricks. Want to know what they are? Trick #1: Use steelhead salmon, sometimes known as steelhead trout. Because it is fattier than other types of salmon, it doesn't dry out as easily. Read: less margin for error. Trick #2: Cook it low and slow. To avoid drying out your salmon, cook it at a low temperature. This trick works whether you're baking or poaching. If you have fish in the oven, set the temp to no higher than 300 degrees. Even lower is better. 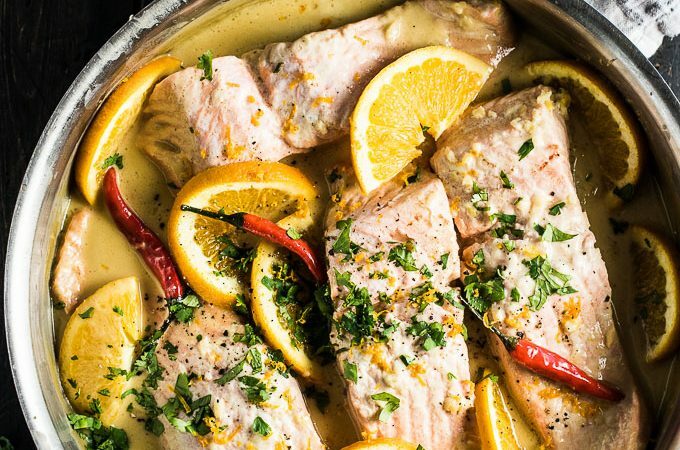 If you're poaching salmon (like in this recipe), you want the cooking liquid to barely be simmering. If you can see more than a few bubbles in the pan, the temperature is too high. The only exception to the low and slow method is if you want to pan-sear salmon to make the skin crispy. In this case, sear on medium-high then pop the pan into the oven on low. If you want to learn more, read the post Perfect Poached Fish for even more tips and tricks. 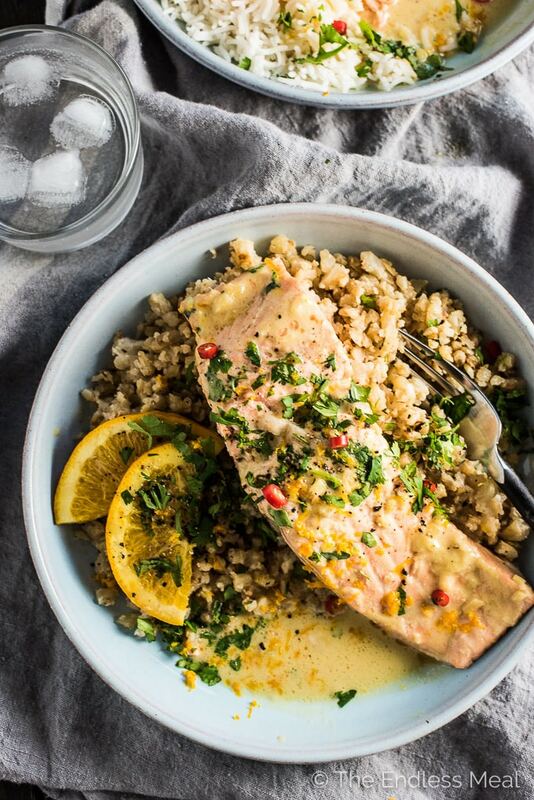 If you make this Coconut Orange Poached Salmon make sure you snap a pic and tag #theendlessmeal on Instagram so I can like and comment on your photos. I love seeing TEM recipes you create! Slice one orange. Zest and juice the other orange and place both in a large skillet. Add the coconut milk, coco aminos, ginger, fish sauce, garlic, and lime juice to the skillet. Bring to a boil then reduce the heat to medium-low. Simmer for 5 minutes. Reduce the heat to low and add the salmon. Simmer very gently (see notes) for about 6-7 minutes, or until the salmon is opaque. At the first hint of white forming on top of the salmon, remove it from the heat. 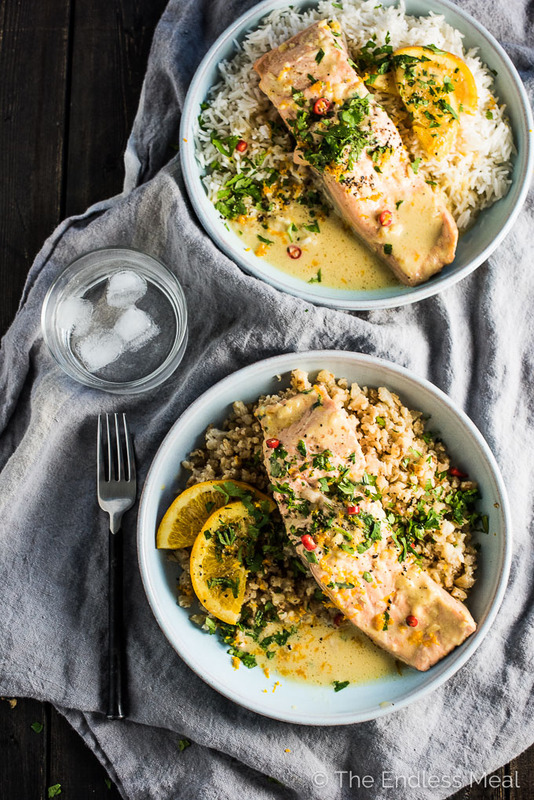 Serve the orange coconut poached salmon with orange zest, cilantro, and black pepper over the top. When you're poaching fish, keep the temperature very low. Ideally, there should be only a few bubbles rising in the pan. I am new to Whole30 and cooking with coconut milk. This may be a silly question…but…For this recipe, do you only use the liquid in the coconut can and not the harder “milk” on top? I have salmon steaks in the freezer and need to cook them up…could I do the steaks instead of the fillets? Would you adjust the cooking/poaching time? I’ve never poached fish before but would love to try this recipe! I have several vacuum sealed, frozen salmon fillets. Do you think it is safe to thaw in refrigerator for a day or two prior to making a dish that calls for fresh? I tried this a couple of nights ago and it was a hit! I didn’t have fish sauce so just left it out. It was delicious anyway, and my whole family loved it. Thanks for an easy, healthy, delicious salmon recipe. my mouth is watering. I’ve been buying ALL the salmon, and am constantly on the hunt for new ways to prepare. i’ll definitely be giving this a try. Salmon is so good, isn’t it? This is my fav way to make it. I hope you enjoy it, too! Okay so I’m in day 15 of Whole30 (halfway mark, YAY!) so I totally feel you right now! But wow this salmon recipe though, Whole30 complaint and totally drool-worthy! Need dis in my life! Welcome to the club! I’m starting to count down the days now lol. I’m sharing a few everyday Whole30 recipes over on Instagram, too. If you make something you’d love to share, tag #Whole30groupies. I love the inspiration!